The organizing faculty members of this year’s program, devoted to Emerging Photovoltaics, are Prof. Jordi Martorell, Prof. Gerasimos Konstantatos, Prof. Valerio Pruneri and Dr. Robert Sewell at ICFO, and Dr. Mariano Campoy Quiles from ICMAB. 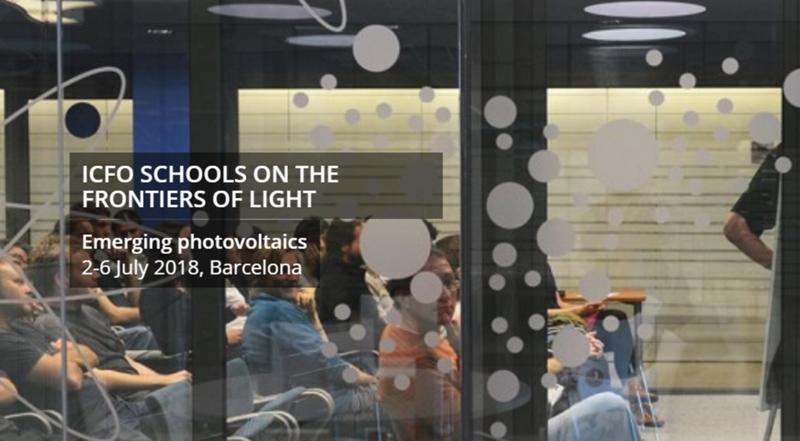 The ICFO School on Emerging Photovoltaics will take place on 2-6 July 2018 at ICFO. The school is open to a limited number of students, selected on the basis of academic merit, and International Travel Fellowships are available to outstanding applicants from around the world. The deadline for applications is Friday, 16 March 2018. Register here! See the flyer here and the School website here for more information.